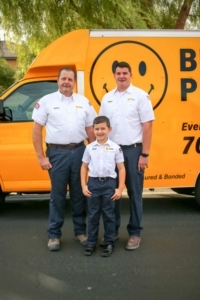 The Las Vegas plumbers at Butter Plumbing offer quality plumbing repair, installation and maintenance services throughout the Las Vegas, NV area. A good plumber can be hard to find in Las Vegas. But the expert plumbing team at Butter Plumbing is just a phone call away. For over 25 years, we have dutifully served the Las Vegas, NV community, ensuring that our customers have everything they need to keep their homes comfortable and convenient. We are locally and family owned and operated, and we pride ourselves on our ability to troubleshoot problems and install new products. We offer a wide range of plumbing services, including whole–house repiping, gas piping, sump pumps, kitchen plumbing, low flow toilets, hydro jetting, main water lines, water heaters, drain cleaning, water treatment systems and pool heaters, among numerous other products and services. In short, we can handle anything plumbing related: from installation to replacement, repair to maintenance. Let us take care of your home. Call us today at 702-655-5214 for all of your plumbing needs in Las Vegas. We are available 24/7. At Butter Plumbing, we want to make sure that your home has an excellent plumbing system at all times. We offer superior plumbing services throughout the Las Vegas, NV area, including installation, replacement, repair, and maintenance. There is virtually no plumbing product or service that we cannot complete: from drain cleaning and reverse osmosis water treatment systems to leak detection and tankless water heaters, we have got you covered. Our Las Vegas plumbers have the experience and expertise necessary to complete your job efficiently and properly. When you think of your plumbing system, you may be focused on the availability of hot and cold water at various fixtures, faucets, and plumbed appliances, such as the dishwasher and refrigerator. But just as important to the functionality of your plumbing system are your drainpipes and sewer line. Over time, they endure a significant amount of wear and tear, and you may find that you need to have yours replaced or repaired at some point. We offer excellent drain and sewer services in Las Vegas, NV because we know how vital it is to have an excellent wastewater removal system. This is not merely a luxury, but an absolute necessity if you want your home to be kept clean and hygienic. From drain cleaning and drain snake services to sewer repair and replacement, we can take care of any leaks, clogs as well as new pipe installation. When it comes to the convenience of the modern home, it’s important to have a reliable water heater. A constant supply of hot water allows you to wake up in the morning with a hot shower or to treat yourself to a warm bath. It allows you to let your dishwasher take care of the clean up after a big family dinner, and it allows you to enjoy clean laundry. It’s hard to imagine what your domestic life would be like without a plentiful supply of hot water. At Butter Plumbing, we understand this completely. We offer excellent water heater service in Las Vegas, NV, including installation and replacement, as well as repair and maintenance. We install and service both tank and tankless systems, and we can find a solution that works well for your home. If you run a business or manage a commercial property, then you need to make sure that your employees, clients and tenants are kept comfortable at all times. When a plumbing problem arises, it’s much more than just a simple inconvenience; your entire business and livelihood might be at stake. As a business leader in the plumbing industry for over 25 years, we understand this all too well. We can take care of your commercial plumbing needs in Las Vegas, NV, from installation to repair, replacement to maintenance. Give one of our friendly plumbers a call today to find out more about what we can do for you. Thank you for the Fantastic customer service. We offer 24 hour emergency plumbing services in Las Vegas NV and we back up many of our new product installation with extensive lifetime parts and labor warranties. Whether you need a new main water line installed or your gas line needs to be repaired, we can take care of the job quickly and professionally. At Butter Plumbing, we have the experience and technical expertise to deliver excellent customer service and quality workmanship. There is virtually no plumbing product or service that we cannot complete: from drain cleaning and reverse osmosis water treatment systems to leak detection and tankless water heaters, we have got you covered.